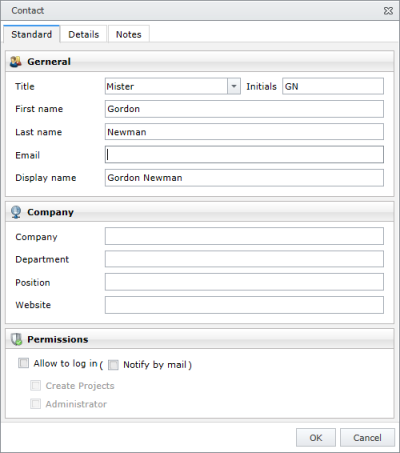 The InLoox PM contact manager gives users the possibility to create an “InLoox PM contact” for each project member. Those contacts that were created in the InLoox PM for Outlook are also displayed here. You can save new contacts and edit the information about people and organizations you communicate with. The procedure of creating and editing is the same. Click the Contacts in the lower left corner of the Projects page that is also a home page. On the Start tab, in the Common group, click New. To assign a new contact to the address book choose first an address book from the drop-down list Address Book, then click New. For more information on how to assign a new address book, see Add, manage or delete an address book. In the General area enter the general information to the contact such as Title, First name, Name, etc. In the Company area enter the information about the company and person's position. In the Permissions area activate the Allow to log in check box to activate the login for a contact and assign the basic permissions. For more information on how to create an account, see Create an InLoox PM account. In the Phone area enter the following information: Phone, Fax and Pager. For multiple phone numbers, use the fields Phone 2 and Mobile. In the Address area, type the business address information of this contact in the respective fields. Optionally, you can add a birthday reminder in the Additional area. Type a note in the Note area, if you want. As soon as you have entered all information click OK. The Contact dialog box for already saved contacts also contains the Projects, assigned with this contact area. There, you see all projects to which this contact is assigned. The standard grouping is set according to the project roles. Add the Outlook contacts via InLoox PM options. Open the options and click Exchange Server in the navigation pane. Then type a domain with contact in the Exchange Server area. You can also add a new contact in the Address Book dialog box when adding project team members or resources to work packages in a project. How to Create a New InLoox PM 7 Web App Contact • Copyright 1999-2019 © InLoox GmbH. Reservados todos los derechos.